The lights came bobbing and jumping up the steep rocky embankment. Ben knew at once what it was: looters, the exact thing he had been left there to protect against. He stood looking down the barren, icy slope; there were maybe twelve of them, more than he had thought. They were still a mile away, clearly visible on the side of the granite cliffs, but coming quickly. How would he stop them? Ben swung his headlamp away from the narrow stone opening he peered out of so they looters wouldn’t see it, and then clicked it on. The cavern he crouched in came to life, grey and frozen. In the center, the “Ice Maiden” as Professor Watkins had dubbed her, lay silent and still. They guessed her at fifteen years old; jet black hair braided with infinite precision, beaded leather tunic still in place, hands clasping her knees, she sat in a rocky alcove the same way she had sat for 500 years or more. 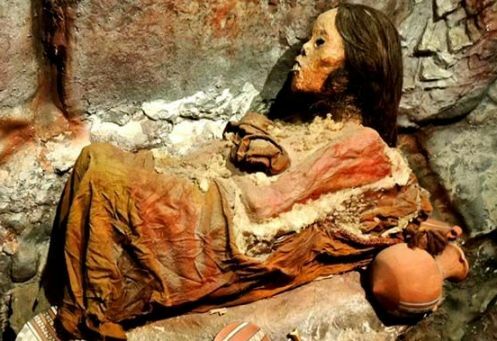 One of the many children the Inca had brought as human ritual sacrifices long ago, these children had been left to freeze and die from the high altitude. They were noted for their incredible preservation; the flash freezing and dry air at that altitude prevented decay. This one was possibly the best ever; her skin was almost living, a light brown, and her fingernails looking still as if she were still alive. From what could be seen of her face (turned down to her lap, hair over it) she seemed to be simply sleeping. “How will anyone know in one day?” Ben asked. And so Ben sat and waited at 12,000 feet in a bare, icy stone hut with a long-dead girl. It had been creepy, but now, with the men coming to sack the sight, he felt a protective feeling towards her. His options were limited but effective; the way to that mountain top involved a newly strung rope causeway leading across a terrific fall; the only route around that was a high level cliff climb. He could cut that rope, making the climb laborious, dangerous and almost impossible in the dark. Ben dimmed his headlamp and found his knife. He crept out of the stone walls and immediately had to hunch over in the freezing wind; it hit like an anvil. He ran in a low crouch to the spot, a hundred yards away or more, where the ropes were attached to spikes hammered into the rock. The group came on steadily, talking and shouting loudly. Once again it occurred to Ben that he should have learned Spanish before going to Peru, but it was too late now. He knelt and gripped the rope, lifting it from the rock. Just as he did, the first of the looters stepped on the far end, making it pull tight with all his weight. Ben’s hand was caught between the rocks and the rope, the rope digging in deeper and deeper as more of the looters began climbing the rope ladders. The men below stopped in stunned silence. They had not expected him. “Get off, now!” Ben screamed. They ignored him, and he felt the rope bearing down harder as more looters began to climb. A moment more and they would be too high to cut free; they would fall into the chasm below—and that would be murder. But a moment more and the rope would sever his hand with its weight. He had no choice. He reached down and at a bad angle, sawed through the rope. The only way through was over his glove; the knife cut into it, and at the moment the rope snapped free with a Tung! sound, the knife bit through his glove and into his own palm. Wincing in pain he drew his hand back. The knife went flying off the cliff. The men below exploded in loud cries of rage and pain. There was obvious confusion below that soon enough resolved into one particular man shouting a long discourse at him. No doubt trying to make a deal, Ben thought. Something whizzed by just left of his head. They were shooting at him! Heart thundering, head hammering from the high altitude, breath sucking in and out, terrified, he crawled back towards the rock shelter. His hand was bleeding, the blood freezing into crust on the glove surface. He could see that they were starting to climb now, totally undeterred by the height. They would reach the top in an hour. Ben could not wait them out on that windy ridge; he would freeze. Ben tumbled back into the small stone hut, rolling into a ball and trying to catch his breath. The moon was rising on the horizon, shining a low beam into the room, falling on the Ice Maiden. She sat, frozen, still, her hair gleaming as it had 500 years before. Ben began moving stones in front of the ancient wooden door. He could collapse a wall so that the front was not obvious. At the ridge, he heard the men reaching the top. Two of them, small men, lightly dressed. He could take them, perhaps push them off the cliff? Was this murder if it was self defense? They were stringing a new rope to bring the others up. One of them shouted a long series of exclamations at the hut, with great emphasis. Ben shook his head and made ready for battle. A trick, no doubt. No; he was stuck. And at least he would be defending the Ice Maiden while he was trying to stay alive. Ben cast a glance back at the maiden he was defending. She had lifted her head and was looking at him with deep ebony eyes. Her face was a frozen thing of terror. It was of all things dark with apparent understanding of other realms and places and of things not human that existed side by side with humans from time immemorial. All at once he understood what was happening. He was in trouble, and not from the looters. In the village below, Professor Ramos drank a long pull of wine. His friend sat with him by the fire in the little house. On the top of the mountain, Estevan Herta, the leader of the villagers and the priests, had finally climbed up the mountain. He and his villagers gathered along the cliff face, and heard the screams in the stone hut. He stared in horror; they had finally done it—they had finally allowed her to wake; they had tricked that poor boy into staying, even as death woke in the room behind him. There was noise as of someone trying to escape the stony shed, and then silence. Estavan had climbed the mountain with the villagers not as looters, but as saviors. He stood in the quiet moonlight, knowing that they were too late, too late, too late. 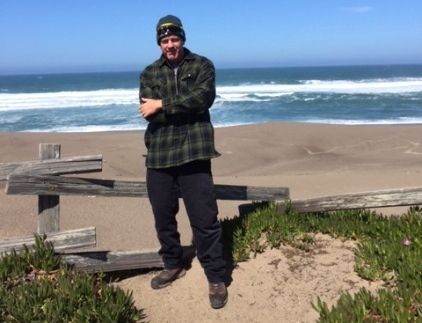 Jonathan Chapman is a life-long California Bay Area resident who works as a Social Worker for a local County. He is a frequent contributor to The Horror Zine.